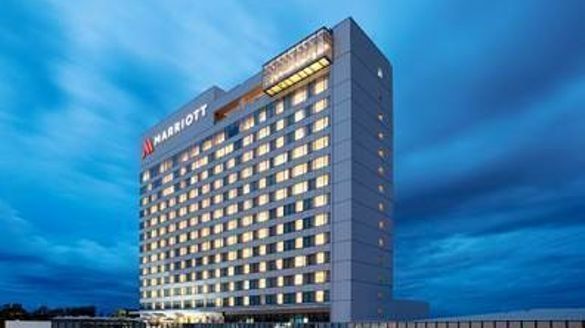 Clark, The Philippines – October 4, 2018 – Marriott Hotels, the flagship brand of Marriott International Inc. (NASDAQ: MAR), announced the grand opening of Clark Marriott Hotel in the Philippines. Owned by Widus Philippines Inc., the hotel is strategically located at the Clark Freeport Zone, making it the perfect destination for business meetings, life’s celebrations or for one’s simplest pleasures or staycation needs. Set in the heart of Clark Freeport, a flourishing urban development, Clark Marriott Hotel is only 2.6 kilometres from the Clark International Airport and within the central business district providing easy access to major corporate businesses, government entities, and well-known city landmarks. “The opening of Clark Marriott is a great example of how Marriott Hotels is letting guests travel brilliantly through its expansion into surprising destinations. As Clark is home to the country’s future premiere gateway, the Clark International Airport (CIA), which boasts of increasing budget flights and flight destinations to key cities in Asia and the Middle East, international guests have endless options to explore new ways of thinking about Clark as a travel destination,” said Mike Fulkerson, Vice President, Brand and Marketing Asia Pacific, Marriott International. With 260 well-appointed rooms capturing the Marriott Modern design ethos. Contemporary design and local combine to create a distinct and vibrant aesthetic. Amenity-filled guest rooms, progressive dining, cutting edge technology, flexible and exemplary meeting facilities and a brand new social event experience make every guest stay special. Innovative spaces, such as The Lounge, allows guests to seamlessly blend work and play. By providing experiences that keep the mind balanced, sharp and inspired, the hotel is the ideal starting point for travelers to do their business or discover the bustling city of Clark. With a range of tempting options, the hotel offers five distinctive restaurants and bars, including Marriott Hotels’ all-day dining venue Goji Kitchen + Bar that serves up authentic regional cuisine with international specialties. Signature dishes include Filipino Adobo chicken, Chinese dim sum and a Western-style carving station. The Noodle Bar offers a concise selection of delicious fresh noodles such as hand-pulled beef brisket noodle and wonton noodles. Urban Coffee Co. is a modern deli where guests can pull up a seat and enjoy a cup of artisanal coffee alongside homemade sandwiches and pastries. Friends, colleagues and families will also enjoy the convivial ambiance at Smoki Moto, a lively Korean barbeque restaurant with two private dining rooms and also featuring Japanese teppanyaki, complemented with signature cocktails including Soju Lemonade and Kimchi Bloody Mary. Savor casual burgers, sandwiches, wings and pizza whilst tanning at the Pool Bar & Grill. Finally, for a quick bite and meeting, the Great Room Lobby features a sample of light bites and comfortable surroundings to enjoy an afternoon tea or light bite and cocktails in the evenings. As a place for both work and pleasure, Clark Marriott Hotel offers flexible event places such as the Grand Ballroom that can accommodate 360 guests and four flexible meeting rooms. Relaxation and recreation await for the whole family at the Quan Spa, Pool Bar, Fitness Center, and Kids Club. Boldly transforming itself for mobile and global travelers, Marriott Hotels inspires brilliance through innovations, such as mobile guest check in addition to the hotel’s Mobile Guest Services. Located in the Philippine’s Central Luzon region, Clark is part of Pampanga province. With a highly improved road network and increasing flights, Clark is setting out to become the hub for business, aviation and tourism in the Philippines. It’s a sprawling, cosmopolitan city that offers many places of interests as well as a host of events and activities. Step outside of the central core to enjoy skydiving, off-road driving, or go hike Mt. Pinatubo over the weekend. To know more about the hotel, call (045) 598 5000 or visit www.marriott.com/CRKMC. And to keep up on their latest offerings, follow Clark Marriott Hotel on Facebook and @clarkmarriott on Instagram. With over 500 hotels and resorts in 65 countries and territories around the world, Marriott Hotels is evolving travel through every aspect of the guest’s stay, enabling the next generation to Travel Brilliantly. Boldly transforming itself for mobile and global travelers who blend work and play, Marriott leads the industry with innovations, including the Greatroom lobby and Mobile Guest Services that elevates style & design and technology. Marriott Hotels is proud to participate in the industry’s award-winning loyalty program, Marriott Rewards® which includes The Ritz-Carlton Rewards®. Members can now link accounts with Starwood Preferred Guest® at members.marriott.com for instant elite status matching and unlimited points transfer. To learn more, visit www.MarriottHotels.com. Stay connected to Marriott Hotels on Facebook, @marriott on Twitter and @marriotthotels on Instagram.